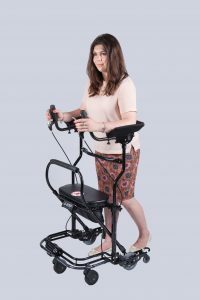 The U-Step 2 is a unique walking aid specially designed for people suffering from Parkinson’s Disease and other Neurological Conditions where there is postural instability. 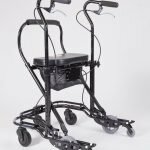 If you have gait freezing or gait ignition failure such as in Parkinson’s Disease and other Parkinsonian conditions as well as in other Neurological Disorders such as cerebrovascular disease, the U-Step can be supplied with an optional Laser Visual Cueing System. The laser projects a line onto the ground in front of the user acting as a visual cue to help trigger the first walking step, break freezing episodes, and increase stride length. The U-Step 2 also includes an audio cue. 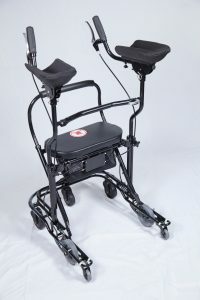 This version also provides an audio beep to assist with walking, with 15 speeds ranging from 59 to 130 beats per minute. Although the U-Step is very stable we offer weights to increase its stability. They use velcro straps to secure to the base of the unit. The U-Step can now be supplied with gutter arms if required. 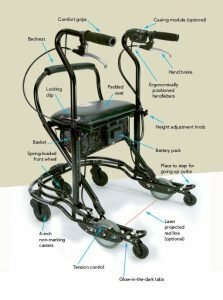 Ideally suited to those with limited grip strength, the Rollator can be fitted with two soft, comfortable forearm troughs that take the majority of the user’s weight instead of it being carried by the hands and wrists. 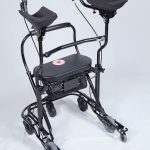 The U-Step is a unique design with seven wheels, designed in the USA especially for people with neurological conditions. Postural Correction: The U-shaped frame surrounds the patient’s centre of gravity, encouraging a more upright posture and reducing the tendency to shuffle (festination). 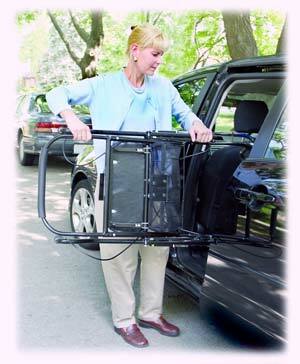 Postural Instability: The U-Step is designed to provide greater postural stability helping to prevent and reduce falls. Users also feel safer because of the U-shaped design that surrounds them while walking. Manoeuvrability: The U-Step also boasts a unique wheel configuration, which enables it to have a very tight turning circle (29 inches/74cm) making it more manoeuvrable in small spaces such as toilets. The patented spring-loaded front caster wheel system glides easily over uneven surfaces. The U-Step can be used inside or outside. Second-hand, ex demo/trial and refurbished units are sometimes available for purchase at considerable discounts – please call or email for availability and prices. You can buy this product if you (or the person you are buying this product for) are chronically sick or have a disabling condition, and the products you are buying (or buying on someone’s behalf) are to help you or them personally. However, you must fill in a VAT declaration form. For more information, see our VAT information page. Please note these videos show the older Mk1 U-Step.